View our Piz Buin range. View our SunSense range. View our Garnier Ambre Solaire range. View our Ultrasun range. This gel feels, cool glides on easily and dries quickly with no sticky feel. Water Resistant. View our Piz Buin range. View our SunSense range. View our Garnier Ambre Solaire range. View our Ultrasun range. Malibu fast tanning oil is designed for dark skins that never burn. Fast Tanning Oil with Beta Carotene (tropical coconut fragrance). SUNLESS TANNING. Dermatologically tested. View our Piz Buin range. 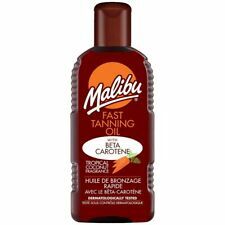 Malibu Fast Tanning Oil With Carotene 200ml. Malibu fast tanning oil is designed for dark skins that never burn. SUNLESS TANNING. View our Piz Buin range. 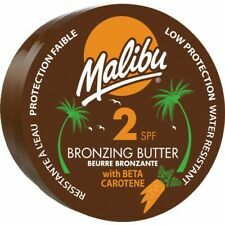 Malibu Bronzing Body Butter SPF 8 with Carotene and Coconut Oik is perfect for skin which burns rarely and tans quickly. SUN PROTECTION. Clinically proven kind to skin and photostable (resistant to change under the influence of radiant energy and especially of light). 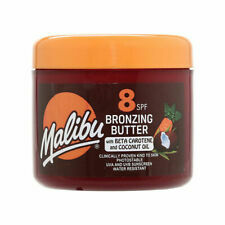 Malibu SPF 6 dry oil gel has added carotene in order to enhance the natural tanning of your skin. The oil is cool when applied to your skin and does not feel sticky. View our Piz Buin range. View our SunSense range. MALIBU Dry CAROTA OLIO Gel SPF 8 resistente all' acqua aggiunta di carotene. Malibu SPF 8 dry oil gel has added carotene in order to enhance the natural tanning of your skin. The oil is cool when applied to your skin and does not feel sticky. View our Piz Buin range. View our SunSense range. Malibu Once Daily Lotion Spray SPF 50 200ml. It contains Vitamin E and Aloe Vera which help to keep your skin nourished. SUN PROTECTION. SKU: 5025135117657. Service Available. Malibu Sun Lotion SPF 50 100ml. Malibu Sun Lotion SPF 50 provides good protection from UVA and UVB. It`s handy 100ml size makes it perfect to include in your hand luggage! SUN PROTECTION. View our Piz Buin range. Malibu Kids Sun Lotion provides high protection from UVA and UVB. Malibu Once Daily Clear Protection Spray SPF 30 100ml. SUN PROTECTION. Service Available. SUNLESS TANNING. View our Garnier Ambre Solaire range. View our Piz Buin range. Malibu Sun Lotion SPF 15 100ml. Malibu Sun Lotion SPF 15 provides good protection from UVA and UVB. It`s handy 100ml size makes it perfect to include in your hand luggage! SUN PROTECTION. View our Piz Buin range. Malibu Once Daily Lotion Spray SPF 50 100ml. SUN PROTECTION. BITES AND BURNS. It is enriched with vitamins and is non-greasy. SKU: 5025135118869. Service Available. Malibu Dry Oil Spray SPF 20. Easy application,very water resistant, dermatologically tested. SUN PROTECTION. For all over body and scalp protection. Non greasy, quick drying. View our Piz Buin range. Malibu Clear Hair and Scalp Protector SPF 30 50ml. This oil is specifically designed for the scalp and hair parting. It is non greasy and quick drying. BITES AND BURNS. Malibu Sun Lotion SPF 8 200ml. Malibu sun lotion provides low protection from UVA and UVB. Water resistant. SUN PROTECTION. View our Piz Buin range. View our SunSense range. View our Garnier Ambre Solaire range. Malibu Dry Oil Spray SPF 30. Easy application,very water resistant, dermatologically tested. SUN PROTECTION. For all over body and scalp protection. Non greasy, quick drying. View our Piz Buin range. Malibu Clear Hair and Scalp Protector SPF 15 50ml. This oil is specifically designed for the scalp and hair parting. It is non greasy and quick drying. BITES AND BURNS. SUNLESS TANNING. Service Available. Malibu Once Daily Clear Protection Spray SPF 30 200ml. SUN PROTECTION. Service Available. SUNLESS TANNING. View our Garnier Ambre Solaire range. View our Piz Buin range. Malibu Sun Lotion SPF 30 200ml. Malibu sun lotion provides high protection from UVA and UVB. SUN PROTECTION. View our Piz Buin range. View our SunSense range. View our Garnier Ambre Solaire range. View our Ultrasun range. SUNLESS TANNING. View our Piz Buin range. View our SunSense range. View our Garnier Ambre Solaire range. View our Ultrasun range. Service Available. SUN PROTECTION. Malibu Clear Hair and Scalp Protector SPF 50 50ml. This non-greasy, photo stable product is specifically designed for the scalp and hair parting. BITES AND BURNS. Service Available. This very high protection lotion spray is easy to apply with it`s spray action bottle. It is vitamin enriched and water resistant. SUN PROTECTION. View our Piz Buin range. View our SunSense range. View our Garnier Ambre Solaire range. Malibu Dry Oil Spray SPF 8. Easy application,very water resistant, dermatologically tested. SUN PROTECTION. For all over body and scalp protection. Non greasy, quick drying. View our Piz Buin range. Malibu Sun Lotion SPF 15 400ml. Very Water resistant. SUN PROTECTION. View our Piz Buin range. View our SunSense range. View our Garnier Ambre Solaire range. View our Ultrasun range. Service Available. 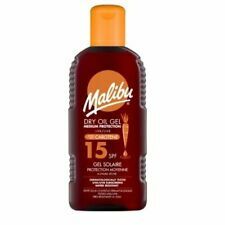 Malibu Dry Oil Spray SPF 15. Easy application,very water resistant, dermatologically tested. SUN PROTECTION. For all over body and scalp protection. Non greasy, quick drying. View our Piz Buin range. Visualizza la nostra gamma di SunSense. Visualizza la nostra gamma di Ultrasun. Malibu Sun Lotion SPF 10 100ml. Malibu Sun Lotion SPF 10 provides low protection from UVA and UVB. It`s handy 100ml size makes it perfect to include in your hand luggage! SUN PROTECTION. View our Piz Buin range. The oil has an amazing tropical coconut fragrance and is water resistant. SUNLESS TANNING. View our SunSense range. View our Piz Buin range. The oil has an amazing tropical coconut fragrance and is water resistant. SUNLESS TANNING. View our Ultrasun range. View our Garnier Ambre Solaire range. View our SunSense range. View our Piz Buin range. Malibu veloce olio abbronzante è progettato per pelli scure che mai bruciano. Malibu Fast Tanning Oil con Beta Carotene 100ml - Perfect Travel Size. Olio d'abbronzatura veloce con beta carotene (profumo di cocco tropicale).